A massive outpouring of generosity has surprised organisers of a Food for 400 anti-poverty drive. 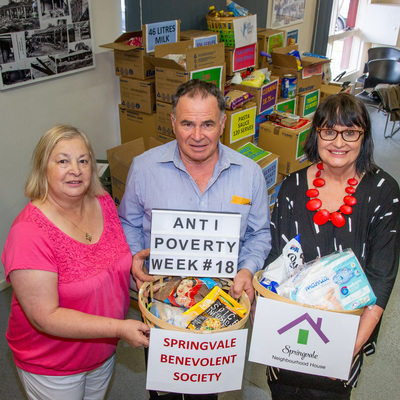 Springvale Neighbourhood House had set a target of 400 non-perishable food items to be distributed to local people in need. However donations tripled expectations – more than 1200 items have formed a momentous ‘wall of food’ at the neighbourhood house. “We thought we could store the food under our desks or on top of our cupboards,” manager Melanie Virtue said. 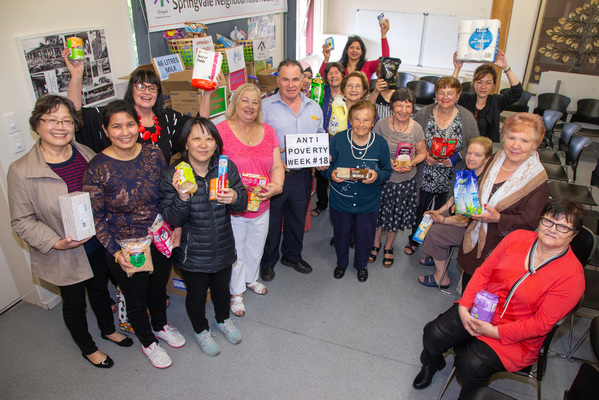 On 17 October, the tonnes of cans, grains, feminine hygiene products, pasta and sauce, coffee and tea, cooking oil and breakfast cereal were presented to stalwart charity Springvale Benevolent Society. An overwhelmed president Joe Rechichi was grateful for the donation. His charity provides $50,000 of annual assistance without a cent of state and federal funding. It delivers food vouchers, food, blankets and other essentials to the doorstep of single mums, single dads, bread-winners who lost their job, and asylum seekers battling on a fraction of the dole. Volunteers see for their own eyes what each household desperately needs. Mr Rechichi told of how as a child, he sometimes went to bed without being fed. For decades, he’d strived to ensure no local child went without food. “I know of children not going to school because they don’t have food to fill a little lunch box. Greater Dandenong councillor Roz Blades, a volunteer with the charity, praised the kindness of the community. “In our lives we all have been in a situation where we don’t have much food. Greater Dandenong was among the most disadvantaged areas in Australia but was a “place that has heart”. The benevolent society is preparing a drive for toys for 500 children and about 250 food hampers for families at Christmas. To donate, call 9546 5558.